A clipping from a very old newspaper (author anonymous) relates - The fact that there are so many LITTLES to be found in Scottish directories by no means indicates a Northern origin. It is practically certain that their forebears came from the south. Little is a real old English name, and it originally applied to little men. Only the first spelling was different and was the Lytle as used by Chaucer in his tales of the Canterbury Pilgrims. But as early as the fourteenth century we find in the Chester Plea Roll the name of one, John the Little or John le Lytle, as being summoned to a jury to hear an appeal against a "false verdict". Little men must have been fairly general or else the Littles spread themselves freely for there have been Littles in, Northern Ireland and Wales for generations. All who have reveled in the romance of bold Robin Hood and his band in Sherwood Forest are familiar with his valiant ally Little John. But even the Littles may be surprised to learn that his real name was John Little and his name was transposed because folk laughed when they found John Little to be a big stalwart fellow capable of dashing deeds of prowess. Francis Little was one of the principal citizens of London in the days of Samuel Pepys and wrote a history which appeared to give the diarist much pleasure. Sir Charles Little was "an honest gentlemen and a soldier" who met with an extraordinary piece of good luck. Lord Brounker, reputed to be a hard, covetous and vicious man and a master at gaming on coming to die, left all his lands, house, furniture and effects to Sir Charles. To whom he had no manner of relation. Prior to 1855, registration of births, marriages and deaths in Dumfrieshire Scotland were voluntarily recorded in the old parochial registers of Langholm and of its neighboring parishes of Westerkirk, Ewes and Canonbie. These records were accordingly searched for the history of James Little and family who emigrated to the Port of Richibucto in New Brunswick in 1819 and the following information is accepted as being authentic: -David Little, born 1717 of Crookholm married Jannet Johnstonne in Evnlie in 1746. A son born 1750 James. Also a son John born 1747 -- witnesses John Murray and others. James Little, born 1750, son of David and Jannet Little, married Elizabeth Irving of Malyssuke in 1776. Children born to this couple were: - A daughter born July 6th, 1777; Margaret, born March 9th, 1778; William, born Oct. 4th, 1779; Betty, born Sept. 6th, 1781; James, born April 1st, 1785; John, born Sept. 6th, 1786; Charles, born October 2nd, 1788; Matthew, born 1791; Andrew, born 1796 and Thomas born 1802. On the 29th May 1810, James Little of Calside, son of James and Elizabeth Irving Little and Mary Linton daughter of Richard Linton of Lochmaben and both of the parish of Canonbie were married. Children born of this couple and recorded in the old parochial registers of Canonbie were -Ellen, born Aug 26th, 1812; William, born April 27th, 1814; Andrew, born July 28th, 1816; and Isobel, born June 26th, 1819. James Little, born in Dumfrieshire, Scotland and son of David and Jannet Little, emigrated to the Port of Richibucto in New Brunswick, Canada in the year 1819 at the age of 69. The exact date of his death is not recorded nor is his grave marked but it is believed he died in the year 1822 and is buried in the old cemetery at the Cape Farm as this was the only cemetery established in Kent County at that time. Not much record exists of his early life in Scotland apart from the fact it was said he was a shepherd and was wont to go bare-footed. He was born during the period following the ill fated rebellion in Scotland in 1745 when the supporters of Bonnie Prince Charlie made their abortive attempt to re-instate him to the throne. These were turbulent and troubled times in Scotland and great hardships were suffered by the Scottish people of all classes. Two of James’ sons, William and Andrew, preceded him to Canada and it was probably the reports which they sent back to the Old Country which encouraged James at his age to make the long and hazardous journey. His wife, Elizabeth, did not accompany him so it is presumed she had died before he left Scotland. He was a spry old man for his years and was gainfully employed at Liverpool by Mr. Samuel McKean, Esquire, no doubt cutting brush and clearing and breaking land and in 1820, aided and encouraged by Samuel McKean he applied for a tract of vacant crown land lying next to McKean's lot. This petition was not approved and a notation is made on the back of it as follows: -"The petition herein described is reserved for the Indians", dated April 5th, 1820 and signed A. Lockwood, Surveyor General. From information recorded in the Crown Lands Office in Fredericton, the Surveyor General A. Lockwood was in office only eight months. He was succeeded by a Mr. Thomas Baillie and a further notation was made on James’ petition dated February 8th, 1822 "Recommended". James had given up the idea by this time of acquiring land and making a place for himself and he died shortly afterwards. William, James’ eldest and Andrew, another son, were the first of James’ family to emigrate from Scotland. They arrived in Richibucto in March 1818. Andrew stayed only a short time for he sailed on a boat going to New England and stayed in the United States a few months then returned to Richibucto. He was then 22 years of age, unmarried and apparently footloose. He eventually in company of a Jonathan Smith, petitioned for land in New Maryland near Fredericton in 1820. 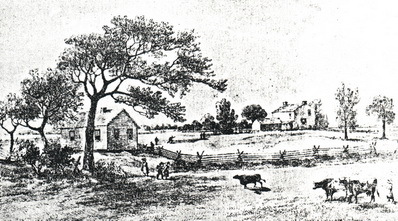 William, the eldest son of James, and his wife Mary stayed on in Richibucto River and applied for and was granted 300 acres of land on' the Richibucto River in 1819 on a tract near the Colpitts Atkinson grant and on which there had been formerly a small clearing by some person or persons unknown who had abandoned it. He later sold this property to John P. Ford in 1827 for one hundred twenty-five pounds and fifteen shillings. In 1829 he was appointed an overseer of the Highway. In 1832 he received a licence to keep a Tavern in Liverpool and was also appointed overseer of Fisheries for the Parish of Liverpool in, that year. His wife Mary died on February 14th, 1837, aged 54 and William must have seen hard times for in 1837 he lost what remaining property he had on a mortgage deed to John Jardine. He left no known descendents. John and Matthew Little, younger sons of James, an older son Charles and Thomas accompanied their father on his voyage to Richibucto. John, born in Dumfrieshire, Scotland in 1786 was granted an allotment of land 200 acres on the south-east side of the south branch of the St. Nicholas River below William Davidson’s grant which he later sold to James Thurrott in 1829 for seventy-five pounds and together with his brothers Matthew and Andrew in May, 1836, bought at a crown land auction in New Maryland three tracts of land for which they paid the following: -Andrew, twelve pounds; Matthew, seventeen pounds five shillings; and John, twenty-two pounds ten shillings. John married a Miss Janet Hughuan and later moved his family to the Harvey district in York County where many of his descendents live today and where a stone cairn has been erected to his memory by his family. Charles, older son of James and Elizabeth, born in Dumfrieshire, Scotland, in 1888 came to Richibucto with his father in 1819 and eventually moved to Kouchibouguac where he bought the Richard Smith grant of 500 acres. His great grandsons Aldon and Edson Little reside there still. Charles died in 1848 in his 60th year. Thomas Little, the youngest son of James the elder and Elizabeth Irving Little came to Richibucto with his father in 1819. He was at that time about seventeen years of age. He was an apt young man and apprenticed himself as a ship-builder and managed to acquire a fairly good education for he was able to gain a position as schoolmaster in Newcastle in 1834 where he taught school for six months in District No.1, Parish of Newcastle. He had in attendance at school, sixty pupils ranging in age from 4 to 16 and composed of 12 girls and 48 boys. One of his pupils was his nephew Jonathan, a lad of 12 years, son of Charles Little of Kouchibouguac. Thomas later went back to shipbuilding and in 1840 was engaged in that trade in Newcastle. He built and launched the vessel "RINGDOVE" which was registered the 8th. October 1844, a vessel of 176 tons. Thomas Little rests in a secluded corner of the churchyard of St. James and St. John in Newcastle and the purity and plainness of his white stone bespeaks a life well spent. He died at the age of 72 and left no known descendents. Of James' two daughters Margaret and Betty, no known record exists of them ever coming to Canada and if such is the case no doubt would have been married and the wife of some settler. James, the remaining son of James Little, was born in Dumfrieshire, Scotland and emigrated to Richibucto in 1819. He died in 1860 and is buried in Galloway cemetery. And it is of James and his wife Mary Linton and their descendents that this record has been written.